This year I’m dividing the gift ideas for beekeepers into categories to make searching a little easier. With one exception, all the items on the list are things I use myself, and they have received my seal of approval. Some of the items are inexpensive “stocking stuffers” and some are more expensive, but each can be used time and again by a beekeeper. Honeybee Democracy by Thomas D. Seeley: This is the book to read if you want to understand swarms and swarming. Although swarms may seem random at first, Honeybee Democracy clearly explains the highly organized maneuver of colony reproduction. The Buzz About Bees by Jurgen Tautz: The Buzz About Bees takes you inside the beehive and explains how bees work and how the colony operates. In spite of the title, this is not a children’s book. Outstanding photographs throughout. Simple, Smart Beekeeping by Traynor & Traynor: This is an excellent beginner book with top-notch illustrations. If there is someone on your gift list who is new to beekeeping, Simple, Smart Beekeeping would be a great place to start. The Bees in Your Backyard by Wilson & Carril: After people start to keep honey bees, they invariably become aware of all the other bees in their backyard. The Bees in Your Backyard will help answer their questions and identify many of those bees. Bee Brush: Bee brushes are especially soft so you won’t injure your bees. Still, learn to use them properly and brush up, not down. Hive tool: The standard hive tool that comes with beginner kits is definitely not my favorite. The only hive tool I use is the one with a J-hook on one end. I couldn’t keep bees without it. Swarm Commander: This is my go-to swarm lure. Although it may seem expensive at first, catching just one swarm will more than pay for it. Just spray Swarm Commander into a swarm trap or bait hive and wait. My first bottle returned a total of eight swarms. Essential Oils: If you like to use essential oils as bee supplements and attractants, 100PureEssentailOils.com has many types at reasonable prices. I’ve purchased from them many times with no problem. My favorite bee attractant is anise oil. Everclear: Unlike isopropyl alcohol, pure grain alcohol is non-toxic. When I’m cleaning propolis from things that don’t need it, including my skin, I prefer the non-toxic stuff. Everclear can be found at most liquor stores and, depending on your state, is available in 151 or 190 proof. You can also use it to make your own swarm lures from dead queens. Sugar: Beekeepers need sugar for a variety of reasons, including candy boards, syrup, queen corks, and fondant. Whenever sugar is on sale, I stock up on fifty-pound bags of plain white refined sugar. It may sound like an odd gift, but a few fifty-pound bags would certainly be memorable. Ratcheting tie-down: I use tie-downs to strap my hives together rather than a brick or stone. I also use them for moving hives on a hand truck or a pickup truck, and I even use them to strap my ladder to a tree when I’m inspecting a swarm trap. I like the kind without hooks on the end (called endless loop tie-downs), but they are harder to find. Propane Torch: I love a propane torch for lighting a smoker because it is fast and efficient. Don’t forget to give a canister of propane along with it. Smoker Pellets: Whether you use a torch or not, KwikStart Smoker Pellets make lighting any smoker easy, and they give off lots of cool, white smoke. Organic Beeswax: People often want a source of organic beeswax to brush on their plastic foundation to lessen the amount of pesticides in the hive. This pure beeswax can also be used for cosmetics. Uncapping Knife: If you extract your honey, a good uncapping knife is indispensable. This stainless steel version is sharp and has a nice feel to it. Honey Sieve: For getting wax debris and bee bits out of your extracted honey, this double stainless steel sieve works well. Broodminder-TH: Using Bluetooth technology, the Broodminder-TH allows you to monitor both the temperature and humidity inside your hive with a glance at your smart phone. Broodminder-W: This ingenious scale weighs your hive once every hour for six months before you need to replace the button battery. The information is sent directly to your smart phone. Microscope with Camera: Until I got a microscope, I didn’t realize how handy they can be for beekeeping. With a power of just 400x you can do your own Nosema testing, you can see bee anatomy up close and personal, and you can gaze at the remarkable architecture of pollen grains. Most modern microscopes come with cameras that attach to your computer so you can save and share your images. Bee Suit: I especially like the Natural Apiary bee suits. They carry several different weights, but the most inexpensive one has served me well. My favorite is the camouflage print. I’ve had fewer stinging incidents with the camouflage (don’t ask me why) but the best part is that wax/propolis/bee poop/and honey stains hardly show. White and other colors are also available. Bug Baffler: This two-piece lightweight suit is made of fine mesh often referred to as “no-see-em” netting. Although not as durable as a cotton suit, I like the Bug Baffler for quick jobs in the apiary, especially on hot or humid days. For some reason, I’ve never gotten stung through this suit. I think there is something about the netting that confuses the bees. Velcro ankle straps: I like to use these when I’m wearing jeans. They keep the little angels from crawling up your legs. Hardware Cloth: Hardware cloth of various dimensions is always useful around an apiary. I use #8 (eight holes per inch) most frequently for things like bottom boards, inner covers, ventilation ports, robbing screens, and queen cages. Ten-foot rolls are available. Electric Drill: Every beekeeper needs either an electric or pneumatic drill and a good selection of drill bits and attachments, including screw drivers and hole saws. Building stuff for the bees is one of the best parts of beekeeping. Fluorescent Green Spray Paint: for those beekeepers who like to trap drones for mite control, this is an excellent way to mark those frames for easy removal. Look for spray paint at Home Depot or other hardware stores. Yellowjacket Traps: The best traps are made with pheromone lures that attract wasps, hornets, and yellowjackets but are completly unappealing to bees. My favorite is the standard Rescue! trap. The traps can be used many years by adding fresh pheromones that can be purchased separately. Butterfly Net: I use a butterfly net for catching bees for identification, trapping and killing hive predators such as wasps, and even removing honey bees from inside the house. A long handle is good for bees trapped in skylights. Butterfly nets come in all sizes and prices. One good source is the Educational Science Online Store. Seeds or seed mixtures: All beekeepers love seeds and are always looking for just the right thing to plant for their bees. You can buy individual varieties such as cosmos or borage, or go for a seed mixture designed for your local area. I like Wildseed Farms for good regional mixes. Flowering trees or shrubs: Need to feed a crowd (of bees)? Try planting a bee-friendly flowering tree or shrub such as cherry laurel, black locust, or California lilac (Ceanothus). Be sure the tree is adapted to the local area. Native Bee Condo: Enthralled by honey bees? All the other bees are interesting too. A simple mason bee condo is fascinating to watch and is a unique addition to any garden, large or small. I hope this list will give you some ideas for yourself or your favorite beekeeper. Most of these items are not beekeeping necessities, for sure. But they are fun to have and sometimes make your beekeeping life easier. 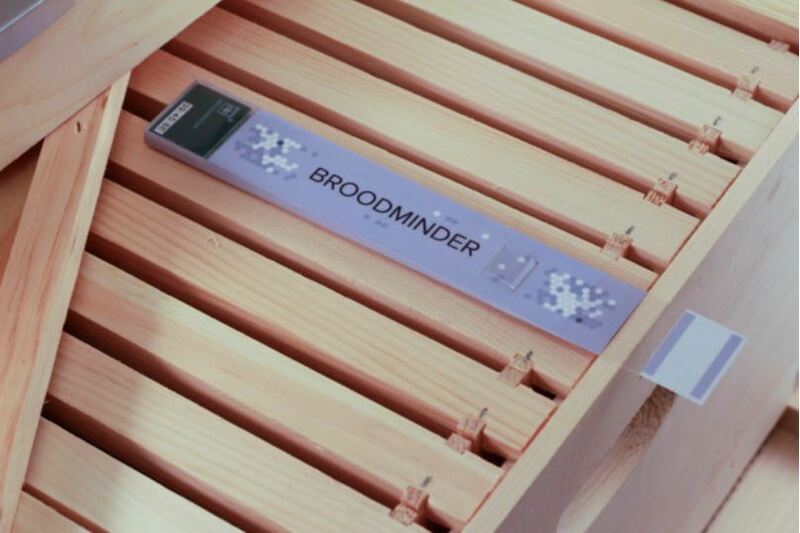 The Broodminder-TH sends temperature and humidity readings to the beekeeper’s smart phone. Photo courtesy of Broodminder.com. Usually enjoy your beekeeping comments but I am surprised you still think feeding white refined sugar mixed with water is OK. I always leave one or two supers of honey on each hive for my bees as this is what they have been collecting all summer in readiness for winter. If you have left enough honey on each hive you should only need to feed in emergencies. If you must be greedy and take all THEIR honey food please use a proprietary, one that is already inverted, sugar mix, as this means less work for the bees. You are extremely presumptuous. Whenever I can avoid feeding sugar, I avoid it. This year, in spite of your accusations, I did not take one single mouthful of honey from my bees. Not a single taste. We had weather throughout the spring and summer that prohibited the bees from making enough honey to survive the winter. I gave them what leftover honey I had in storage from last year and then started to feed sugar. Furthermore, it is not necessary to invert sugar for bees. The enzymes in their saliva invert it automatically. You have to remember that sucrose is one of the sugars most commonly found in nectar, and bees are quite well-equipped to handle it. This has been researched over and over by others. Thank you for calling me greedy. Now, go find yourself another website to hang around. Name-calling is not productive, nor is it particularly attractive. We can do without you. Thanks Rusty! Ignorance is not bliss. Thanks for standing up to it! (Mike) Best of the Christmas season to you and yours. Blessings from NW Wisconsin. Thank you, Rick. And Merry Christmas to you, your family, and your bees. A perfect gift for any beekeeper is a stethoscope which can easily be found on eBay. A stethoscope will easily allow anyone to check on the bees to hear them buzzing in the hives during winter or for locating bees in walls. I have several in my truck, bee box, and in the shop. Great list! I have borrowed a FLIR iPhone attachment but have not found it really shows me where the colony is so far though. The readings seem to be too unreliable (this may be operator error on my part!). So far it works well on humans but not so well through the wood of hives. I don’t know if it applies in your case, but I’ve heard that unless there is a fairly steep difference between the internal hive temperature and the outdoor temperature, they don’t work very well. In other words, they are a wintertime tool. You might have better results as the winter gets colder. WOW, I have been doing a cram course on beekeeping for the last two years and reading as many books & blogs on bee websites as I can find and today is the first time that I have seen someone tell a rude poster (Mike) to high tail it. Kay-Does to you Rusty. Thanks. I was kind of worried about offending other readers. I’d suggest a Presto Kitchen Kettle, in place of a crock pot for melting wax. I used one for when I was making candles. They’re very popular among candle makers. Most of us drilled a hole in them and tapped it to make threads, then put a valve in them to act as a spigot. If you Google “presto pot wax melter”, you’ll find numerous plans for doing this and several web sites that offer the pot with the valve already installed. Last I checked, the pots were $20-$25 and the parts for the modifications were less than $10. Just checked and found one site that sold them with the spigot already added for $59. If you need a larger capacity, you can go to an electric turkey roaster, which is also popular with chandlers. About twice the capacity of a presto pot or crock pot. Last I checked they were about $40. But you can’t add a spigot to them. Interesting idea. The whole wax-melting ordeal overwhelms me sometimes. So messy. Waxed paper is your friend. I used to roll it out over the counter tops and put the presto pot on top of it. And I’d cover the cooktop with foil, when using a double boiler. And you can use newspaper or whatever you have on the floor, held down with painter’s tape. Cleanup then takes about two minutes. You can even fold up the wax paper and store it a plastic bag to re-use later. I sent you a link for the instructions to add the spigot to the Presto pot. Thanks for the tip and the link. I haven’t had time to study it yet, but I will get back to you and perhaps use it in a post. Thanks, Rusty – sharing on our club’s page. Under Electronics, I would add an indoor-outdoor thermometer. Good ones are made by Oregon Scientific, which offers options like multiple outdoor sensors (for greenhouse, barn, bee yard, ambient air), anemometers and humidity sensors. I use mine to judge how close my area’s weather is to conditions on Weather.gov and whether to scramble the insulation boards on, varroa drawers in or out, etc. And thanks for telling “Mike” that he’s not as smart as he thinks he is. The indoor-outdoor thermometer is a great idea, and I agree on Oregon Scientific. Their products seem to last forever. I agree, Rusty!! Great Job!! I, too, have relied upon your website for beekeeping advice and have followed your recommendations, advice and have had success with it. You, by far, have been instrumental in my beekeeping adventures. I have taken several classes (including the Montana Apprentice level beekeeping class) and have valued/used your information the most. You put my worries at ease, just knowing you worry about the same stuff. So, yes, Kudos to you for putting a guy (Mike) in his place. Hopefully he is not on this website again. Thank you for all your effort and enthusiasm. Love the bees and the blog!! Thanks, Chelle. I appreciate the support. I’ve been keeping bees for 10+ years and the only thing I’m really sure of is if you ask two different beekeepers their opinions on how to do something, you’ll get two different answers. Nothing wrong with that. Good for you Rusty, keep doing what your doing and do it as well as you can, no need to put up with nonsense, you have a great, informative website going. I love the idea about using a stethoscope. Always room to learn more things. I, too, love the stethoscope idea and will give it a try. The Mike post was actually kind of fun to read. He immediately clanged the alarm bell labelled “I arrogantly know everything even if I’m oblivious of the facts!” Cool. Lots of great ideas here, as always. This is YOUR blog where you generously share your expertise at great expense to your time. Holier than thou beekeepers are plentiful and can easily be found in groups on Facebook. Mike can find a cozy niche there. His comment was offensive. Your response was not. Thank you and Happy Thanksgiving to you as well. Rusty, it didn’t offend me, bought a smile to my face with my morning coffee. Obviously an off the cuff “greater than thou” comment from someone who has not read many (if any) of the historic posts of your very informative blog. There are a lot of beginner hobby beekeepers out there starting nucs and packages each season, they do not have reserve supers full of last season’s honey, sugar syrup can be their only means of supplement feeding. All power to you, do not tolerate such comments, as you say we do not need them! Now, how do I convince Santa I NEED everything on that list? Instead of offering Santa cookies and milk, leave out honey and biscuits. Maybe he will get the message. Oh rusty, you surprise me but in a good way! Rusty, I only have two new spring nucs getting established in their first season. No spare last season honey. So, can I leave him sugar syrup and biscuits instead? I think you better invert the syrup so Santa doesn’t get indigestion. So, 2-1 or 1-1 do you think? Then there is the question of added essential oils. I am leaning toward wintergreen, or cinnamon………. I’m a Danish beekeeper, sitting here inside cosily and watching my hives outside, in the snow. I’ve kept bees since 1972 and travelled extensively, dealing with Asian bees, African bees and stingless bees (Trigona). Many bee-websites have I visited, but yours, Rusty, is till now the best I’ve seen. I enjoy every issue. As for Mike, he doesn’t know much about bees. That they should be better off in the winter on honey stores, than on sugar stores, is not my experience. We (some Danish beekeepers) made extensive research on the subject in the seventies and found that bees actually winter better on white sugar than on honey. Honey often granulates in the combs during winter, making it inaccessible to the bees. This does not happen to sugar syrup. Sugar syrup doesn’t have impurities that may upset the stomach of the bees, as for instance heather honey does. There’re other advantages in using sugar for winter feed. Only, one should not use High-Fructose Corn Syrup. Your recommendation of books on beekeeping to read is excellent. I have several feet of such books on the shelf, and I agree that Thomas D. Seeley’s books are very good and informative. His other book, Honey Bee Ecology, is certainly also worth reading. They’re expensive, yes, but very enlightening. and provide good reading for many hours, days or months. Thanks, Rusty, from the cold Scandinavia. What a nice compliment! Thank you so much. Yes, I have read different studies showing that honey bees actually can winter better on pure sugar syrup than they can on honey, especially honey that is high in ash content and/or other impurities. And in areas of intense and prolonged cold, the advantages are especially evident. I also agree that HFCS should be avoided. Please continue to enjoy your cold weather: bee books and cold weather are a perfect match. So far, winter here has failed to make an appearance and I’m getting impatient. Jan Ollsson, I am very interested in your comments. Being a second year beekeeper, I have a lot to learn. I am trying to understand the honeybee’s needs and source of water, year round, and the impact of feeding dry sugar, sugar syrup and honey. Do you have references I can research or a published document by your group. Ooh, thanks for that lovely list of possible gifties!! I’d love Santa to get me a few of those, especially a butterfly net! The number of times I have wanted one of those things this year! Especially to rescue a few stray bees that venture into the house or garage. I’m saving for an IR camera…I worry too much about my 3 hives here in Manitoba, Canada… I’ve done everything for them that I possibly can, sheltered, insulated, seen they have enough honey and supplemented with candy cakes in case… But when our temperatures dive to -30C or less…ew! LOVE your blog, thanks so much for sharing your passion here and teaching us newbees so very much! I use my nets constantly. I catch bees in the house, snag wasps that are bothering my hives, and I also use them for identifying native bees. I don’t kill the natives, but just enjoy the chance to see them up close before they fly away again. Hi, I hope you don’t mind a question from a non-beekeeper. All I know about bees is that I think they’re brilliant, they scare me, and honey’s lovely as well as good for you. A good friend has kept bees for about 2 years now and I would like to get them a present. I had thought that a beekeeper’s garden was a no-go area and was delighted to find otherwise. My friend has won awards this year and I would suppose has all the necessary equipment so my question is what would be handy to have two of? The brush, J-tool? I probably cannot afford the electronic things mentioned. They said something about a swarm earlier this year so I am wondering about the Swarm Commander? What would you experienced beekeeps have liked? Is there any chance that getting organic beeswax could cause offense? Would you not use your own beeswax (I ask on the basis that if you don’t know the answer then question isn’t stupid?). I’ll get some of the flower mix mentioned for both of us and I believe that bees are in trouble at the moment – someone said not to cut the dandelions as it the bees’ first food of the year – is that true? Thanks and I apologise if anyone thinks this foolish (you are tough cookies!). Well, Anne, there is nothing stupid about your questions at all. In fact, they are very good questions. Speaking for myself, I could always use another hive tool. They get lost easily, and if he doesn’t have the j-hook type, I think he would really like it. If he likes to catch swarms, the Swarm Commander works really well. It has a shelf life of about two years, so it would be best to know if he already has some or not. The organic beeswax is often used by new beekeepers to wax new foundation, but since he is an established beekeeper, he might want to use his own, although I sure wouldn’t be offended if someone gave me organic beeswax. The hardware cloth comes in handy, especially if he makes or repairs his own equipment. Flower seeds are always helpful, too. Yes, dandelions are good early forage, so it’s best not to cut them if you can avoid it. Does someone else have an opinion for Anne? Thank you sincerely for your reply. I will get that J-hook tool you mentioned and I’ll try to find the hardware cloth also. As this is a .com site, we are probably not in the same country so I’ll get in touch with the Beekeepers Society to find out where I can them. Just as an aside, I won’t get a book because I doubt my friend could pass a shop with book about bees in it – come to think I doubt they could pass any bookshop!! I do appreciate your kindness. Best of luck with all things bees. Click on an apiary to see the hives, and then click on a hive to see all the data associated with a hive. Its fascinating to see data from other beekeepers in your area and around the world.